Lisa is with Team Models(Norway), Supreme (NY), Women (Paris) & MP (Milano). PONY RYDER: When and how did you start modeling? LISA GREGUSSON : I was in London with my grandmother on vacation when I was 15. A scout came running after us at the metro station and said: “Your granddaughter has to become a model!” He gave us his card, but I didn’t think much about it. When we got home to Norway, my grandmother called Team Models to check if the scout’s agency was a serious agency. And then she made me an appointment with Team without telling me! I wasn’t too happy about it, because I found it scary and thought it was nothing for me. But I soon learned that it’s a lot of fun, and now I’m so happy about what my grandmother did :) . PONY RYDER: What are your first impressions of modeling? LISA GREGUSSON: So far, I've only had good experiences (apart from the times when I get an afro and have to wash my hair for at least half an hour to straighten it). Both shows and shoots are fun, and even the waiting is ok. There's often a lot of waiting, but just by talking with the other girls, or bringing a book, I have a good time. There are so many great photographers, make up artists and stylists, always someone to talk to and laugh with. PONY RYDER: By your opinion, what should a girl be like, to sign up with Supreme? LISA GREGUSSON : Every Supreme girl has her own look, not the typical commercial model. I think there should be something about her that catches your interest at once. PONY RYDER: Paul Rowland makes great polaroids. Does he give you instructions during the polaroid shoot? LISA GREGUSSON: We try out different things, and usually, when we’re just talking or looking at the polaroids, he sees something in the way I’m standing or sitting, and starts shooting some more. PONY RYDER: How do you pose for polaroids, and how do you pose for tests? LISA GREGUSSON: Well, at least I try not to do the same pose for the whole shoot. After my first tests and gaining some confidence, I figured the pictures turn out so much better, and the photographer is much happier, if I try to do something over the top. Just stop being nervous about looking stupid, and be daring to try something crazy. PONY RYDER: What is the most important thing that a girl should do to present herself well in castings? PONY RYDER: Did you learn about the modeling business yourself, or …? LISA GREGUSSON: I've had a couple of walking courses with Team Models, and whenever I have a question, I ask either them or one of my other bookers. PONY RYDER: Have you ever had to make a decision whether to skip a season because of school or personal reasons, and what was your decision? LISA GREGUSSON: Aaah, I'm skipping every one of them because of school! It's very tempting, but I won't drop out. I can't say how important it is to finish school. But I'm looking forward to being able to work (very soon!). PONY RYDER: What do you do for fun in Norway? LISA GREGUSSON: Luckily (until global warming puts an end to it) we have both great snowy winters and sunny summers in Norway. I’ve never managed to decide what time of the year I like the most, because I love swimming in the summer, and go skiing in the winter. And here I have the opportunity to do both. PONY RYDER: Do you have hobbies? LISA GREGUSSON: Hobbies: snowboarding, cross country skiing, ice-skating, swimming, playing the piano, and I loooove dancing! PONY RYDER: You have beautiful pale skin...How do you maintain it? LISA GREGUSSON: I never go to bed with make up on, no matter how late it is or how tired I am. When it comes to products, I use almost whatever's in the local store, Nivea's products are great. LISA GREGUSSON: Sleep a lot! PONY RYDER: Fantastic strawberry blond hair! What hair products do you use? LISA GREGUSSON: K-pack from Joico, and a lot of conditioner (whatever kind of brand, just a lot!). LISA GREGUSSON: YSL concealer, mascara and a lip balm. PONY RYDER: Almost every girl I interviewed uses YSL concealer, what is it for? LISA GREGUSSON: I'm not really sure why YSL's the one I chose in the first place, but I like it, so I've never bought any other brand. It's easy to apply, and I've found a color I like. PONY RYDER: Do you use sun block, and if so which one? LISA GREGUSSON: Yes!! Sun block's important:) I normally use Nivea or Garnier, at least SPF 20. PONY RYDER: Are you a Pringles type or chocolate type? What is your favorite food? LISA GREGUSSON: Chocolate over Pringles any day!! Mmmm! I think my favorite food is sushi. And olives. And my little brother's homemade Maryland Cookies. And my little sister's carrot cake. And self-fished mackerel. And..I can't decide! PONY RYDER: What advice would you give to new models? LISA GREGUSSON : First of all: finish school! And don't bother to be embarrassed in front of the camera, it just stresses you out and results in worse pictures than if you stop caring. PONY RYDER: Do you have a model friend that you would like to see presented on Pony Ryder blog? 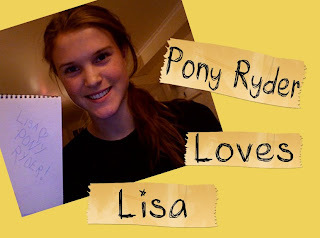 Pony Ryder smiles with Lisa!!! Interview with fashion model is original work and courtesy of Pony Ryder blog.